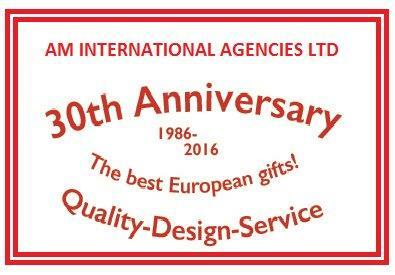 Our Mission - AM International Agencies Ltd.
Our mission is to provide our customers, mainly based in the United Kingdom and Ireland, with the highest quality porcelain gifts, toys, collectables, souvenirs, wooden toys, educational products, teddy bears and soft toys. We are increasing sales by using new technologies, an informative website and offering an outstanding service to our customers and suppliers. We also provide our customers with products that have the highest level of safety, originality, durability and educational design. All our products are thoroughly tested to comply with the relevant Standards and we only distribute products that are FSC accredited and from sustainable sources. The factories for whom we act are eco-friendly and committed to protect our environment. Employee satisfaction is important to us and we provide an enjoyable, fair and incentivised workplace for both employees and owners. At all stages, we always intend to provide our customers with the best buying experience and customer service when they select our ranges of porcelain gifts, wooden toys and teddy bears. Our service includes an informative and up to date website, understanding and cooperation from all our staff members, high quality products and an enjoyment in being our partner.